This lovely petite bowl was made sometime in the years 1787 to 1833 by Wallendorf Porcelain (Wallendorfer Porzellan), founded in 1764 in Thuringia, Germany. The company achieved a superb reputation for their snow white, hard paste porcelain and beautiful hand painting. It stayed in the hands of the founding family until 1833, when it was sold to Hutschenreuther. 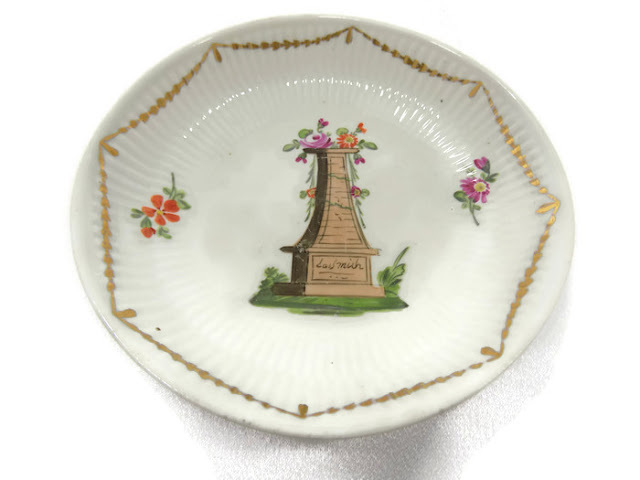 The hand painted design on this bowl depicts a monument draped with flowers and bearing the inscription on the base " Lass mich." We've translated this German phrase to 'leave me,' which leads us to believe it's a grave memorial. Two nosegays of flowers and gilt trim with tassels decorate the raised, ribbed rim. The underside bears the simple cobalt blue letter W which was used from 1787 onward, when Meissen forced Wallendorf to change their mark, charging that it resembled the Meissen crossed swords. There is also an old paper label on the bottom, probably identifying the piece in a collection, although the writing, if there was any, has completely faded away. 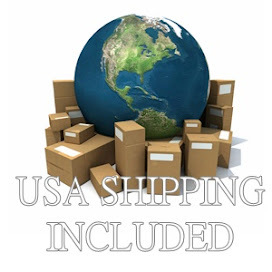 The bowl measures 5 inches in diameter and stands 1 inch high. The porcelain has a few tiny spots of iron residue that have worked their way to the surface over the centuries and there is some slight wear to the paint on the column, but overall the bowl's in excellent condition--no chips, cracks, stains or repairs. Pieces like this one, given as gifts, were treasured and spent their lives protected in vitrines and cabinets.